US and Iraqi forces fought a significant street battle at Haifa Street in the Karkh section of Baghdad on Tuesday. Ground forces were supported by US fighter jets and helicopter gunships. The fighting left 50 persons dead, which the US said were Sunni Arab insurgents. 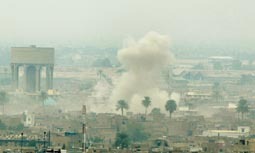 The Shiite government of Iraq announced the discovery of several terrorist storehouses in the course of the operation. In contrast, the Association of Muslim Scholars, a Sunni religious association, described the operation as a “bloody sectarian massacre.” The Sunni Arab narrative, enunciated over the weekend by MP Adnan Dulaimi, is that the Shiite militias are attempting to drive Sunni Arabs from their neighborhoods in the capital, and that the Mahdi Army had attacked Haifa Street Sunday and been driven back. Al-Hayat writes in Arabic that locals say a (Shiite) militia invaded the quarter on Sunday and captured and killed 15 residents, then threw their bodies in the street. In this context, some Sunni Arabs see the US as having been duped by the Shiites to join in the ethnic cleansing of the Karkh district. Haifa Street has been an important thread in the saga of Iraq’s civil war. In In July of 2004 we saw the huge “Operation Haifa Street,” involving 3000 US troops. There was the massive carbombing there of a police station in 2004, which doesn’t seem to show that “Operation Haifa Street” was exactly a success. Even at that time, the US GIs called it “Grenade Alley” and “Purple Heart Boulevard” and fought constantly with locally based guerilla groups. It has been radicalized and supposedly pacified over and over again. By March 2005, the NYT found that the tide was turning on Haifa Street. CSM reported that it had calmed down under Iraqi army supervision by May of 2005. A year and a half later, and it is still a “terrorist stronghold” and we have yet another pacification effort. Or maybe by now it is just being levelled by airstrikes. Or maybe we really have been duped into ethnically cleansing it on behalf of the Mahdi Army. Bush’s Iraq War is like Groundhog Day, the Bill Murray science fiction film about the guy doomed to live the same day over and over again. How is 2007 different on Haifa Street from 2004? The Americans keep putting their eggs in the basket of “standing up” the Iraqi army. Nancy Yousself reports on how difficult that is, given sectarian divisions. The problem with using armies to settle civil conflicts is that the army inevitably becomes infected by the same sectarian or ethnic passions that inflame the general population, so then it cannot be the solution. Carl Conetta of the Project for Defense Alternatives doesn’t think this surge thing is going to work out very well. He gives his reasons. Another US soldier died Tuesday of wounds inflicted on him by guerrillas. Police found 40 bodies on Tuesday in Baghdad and another 6 in Mosul. Mosul is now Iraq’s second largest city, and a major Sunni Arab center. That it is beginning to generate dead bodies in the street is a very bad sign, since security forces are likely to be withdrawn from there for duty in Baghdad in coming months. Reuters reports other bombings and killings around the country. Militiamen kidnapped Sunni pilgrims returning from Saudi Arabia. Sunni MPs are accusing the special police commandos of the Interior Ministry in the kidnappings. The police commandos have been heavily infiltrated by Shiite militiamen of the Badr Corps (the paramilitary of the Supreme Council for Islamic Revolution in Iraq) and, it is alleged, from spring 2006 by elements of the Mahdi Army. (Some rogue networks inside Badr are alleged to collaborate with the JAM). An Iraqi judge is alleging that elements of the Mahdi Army have infiltrated the Green Zone, the area behind concrete barriers where the Iraqi government offices are. Sunni Arab guerrillas have long been said to be trying to figure out a way to get into the Green Zone and conduct a major operation there. So far they have failed, but was the truly credible threat from a different quarter? A UNICEF staffer was shot in his car in Baghdad on Tuesday. Iraq is too dangerous for some children even just to go to school. Trudy Rubin of the Inquirer on Gen. David Petraeus’s past successes and present challenges.